Wilton Place and the Brunswick Hotel had not come into being. Its first landlord was Mr. W. Jones. Unfortunately Mr. Jones succumbed to a short illness. The family left the hotel. The Brunswick Hotel was built in the early 1860’s and, after the Rutland Arms, was the town’s largest and foremost hotel. Initially it was a beerhouse, without a licence to sell wines or spirits and had stabling for two horses and a coach-house. According to testimony given by William Jones in August 1864 at Smalley Petty Sessions — for the renewal and granting of Victuallers’ Licences — he had kept the hotel since about June 1862, when he also kept a grocer’s shop in the town. 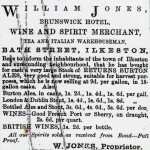 However in 1864 William was granted his licence and this enabled him to become a wholesale dealer in wines and spirits. William Jones was born at Wheelock near Sandbach, Cheshire in 1830, the son of innkeeper James and Harriet (nee Wantling). In 1852 he married Sarah Burstone Ashley, eldest child of excise officer Robert and Ann (nee Burstone) and the couple spent the first years of married life at Nantwich, Cheshire where sons William Ashley and Edwin were born. In the later 1850’s the family moved to Nottingham, birthplace of children Rosa Jane (who died in infancy) in 1858, Frank Ashley in 1860 and Louisa Jane in 1861. A short time later the family arrived at Bath Street and daughters Annie Rosa, Lucy Harriet and Rosa Mary were born there in 1863, 1864 and 1868 respectively. Louisa Jane, Annie Rosa and Rosa Mary died of scarlatina within three weeks of each other in the winter of 1869. While William also traded as a draper, White’s Directory of 1865 lists him as proprietor of the Brunswick hotel as well as entering him as ‘grocer and tea dealer, and wine and spirit dealer of Bath Street’. Harrod and Co’s Directory of 1870 similarly records two entries for William — at the Brunswick Commercial hotel, wine and spirit merchant, and agent for Ind, Coope, and Co‘s Burton ales as well as grocer and provision merchant, Bath Street. After the birth of son Thomas Percy in 1871 the licence for the hotel passed to Thomas Whitehead and Henry Walker of Nottingham, and the Jones family moved to Broughton in Salford, Manchester where William then worked as a clerk. Eldest son William Ashley Jones returned to Ilkeston from Salford where he was working as a grocer’s shopman, to marry Mary Jane Paling, eldest daughter of auctioneer, estate agent and valuer Frederick and Catherine (nee Spencer) in July 1876 and in April 1877 opened a tea shop at the Commercial Buildings in Bath Street. In June 1880 Mary Jane and her mother – who then lived in Station Road – were offering themselves as Music Teachers. Their sons William Paling Jones (1876) and Frederick Harry Jones (1880) were born in the town. Shortly after the death of Frederick Harry in August 1880, the family left their Chapel Street home to move to Broughton, Lancashire, where Mary Jane taught music. For a time after their marriage Mary Jane’s younger sister Elizabeth Paling stayed with them as governess. 2. Eddie Jones married Miss Betsy Lowe, third daughter of Mrs. S. Lowe, Grocer, South Street. Edwin also returned to Ilkeston to marry Betsey Lowe and we shall meet him in South Street. 3. Emmie became a schoolmistress, her youngest sister living with her. 4. The only Jones daughter to survive into adulthood was Lucy Harriet who in 1890 married tailor’s shopman Joseph Robert Parslow of Moss Side, Manchester and by the end of the century was living a few doors from her parents at Broughton, Salford. In May 1874 Edna Annie Davies (nee Woodward) of Lower Granby Street went to the Brunswick hotel in search of her husband, collier Edward Haynes Davies alias ‘Staffordshire Ted’. Whilst there she was invited to have a drink by a young man and accepted, behaviour which her husband objected to. To show his displeasure, when the pair returned home, a drunken Edward battered his wife, giving her two black eyes, multiple bruising over parts of her body, and causing her to vomit blood. Edward argued that he had only hit her with the back of his hand and so could not have caused his wife’s injuries. Less than a week later she died from ‘inflammation of the bowels and peritoneum’. The couple had been married for just over ten months and Edna Annie was aged 20 when she died. After an extensive inquest held at the Rutland Hotel, at which several neighbours and local surgeons gave evidence, the Coroner’s jury were convinced that Edward was guilty of manslaughter and returned that verdict, with which the Coroner concurred. The husband was then committed for trial at the next Derbyshire Assizes. The case aroused very strong feelings within the town, none of them sympathetic towards Edward. At the time of the inquest hearing crowds of several hundred persons, mostly women, assembled outside the lock-up at the Town Hall, outside the Rutland Arms, and outside the former home of the deceased. They were in very vocal and riotous mood. After the inquest but before Edward’s trial a wave of concern and indignation swept through parts of the town. At the junction of Awsworth Road and Cotmanhay Road an open air meeting was held one Tuesday evening, attended by a large and deeply attentive audience – between one and two thousand people the Ilkeston Telegraph estimated – and addressed for over two hours by several local clergymen. Their themes were “the brevity and uncertainty of human life, the importance of young women accepting as their companions in life young men who were religious or at least sober and industrious, and the deplorable evils of intemperance”. In particular the plethora of public houses within Ilkeston attracted severe criticism, and the feeling of all the speakers and all their listeners was that no more licences should be granted within the town. 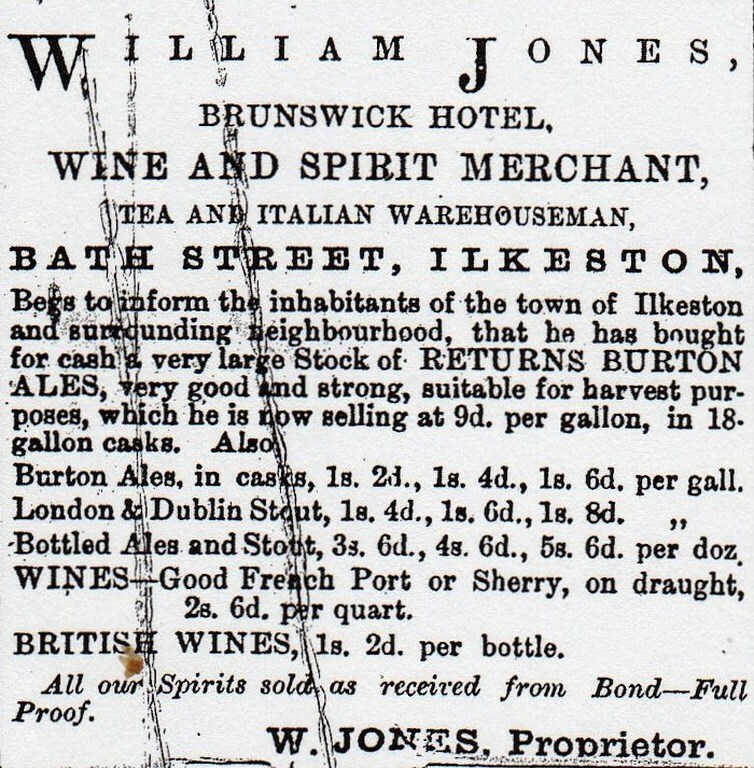 At this time there were 62 places in Ilkeston where spirits or other intoxicating drink could be obtained. At the Heanor Brewster Sessions in September of 1874 – where applications within the district for new licences were considered – two memorials were presented to the magistrates exhorting them to refuse any additional licences for Ilkeston so as not to add to the drunkenness within the town. The source of one of these memorials was the ‘general inhabitants’ and was 16 yards long, with a double column of names, 2644 in total. At Edward’s trial for manslaughter at Derby Midsummer Assizes the judge directed the jury that if the assault had caused or accelerated Edna Annie’s death then the husband was guilty of the crime. The jury however decided that her death was in no way connected with the abuse and the collier was sentenced to 12 calendar months imprisonment with hard labour for wounding with intent to cause grievous bodily harm. Edna Ann was the illegitimate daughter of Maria Woodward who gave evidence both at the inquest into her daughter’s death and then at the subsequent trial of Edward Davies. Since the marriage of her mother to brickyard labourer Henry Clifford in May 1858, Edna Ann had been raised by Bath Street fruiterer Charles Chadwick. Just over a year after Edna Ann’s death her mother gave birth to a daughter whom she named Edney Ann Clifford. In June 1874 Richard Flewitt was the proprietor of the Brunswick which was then 79 Bath Street. By August 1878 William Ball was the landlord and in October 1879 the licence was transferred to William Stone, coming from Silesby, Leicestershire. William Ball moved on to the Sir John Warren. Travelling photographer John Ashmore — residing temporarily at the Old Harrow Inn Yard — was proceeding down Bath Street, perched on the shaft of his mobile ‘home’ (i.e. his caravan) and made it as far as the Brunswick Hotel without mishap. However at that point he was pitched off the ‘van’ and fell under its front wheel which ran over his leg. Before the rear wheel could follow the same path he was dragged out of harm’s way by a plucky passer-by. John was then carted off to Dr. Roland’s nearby surgery where the injuries were diagnosed as very serious. The photographer was well-known in Ilkeston, usually spending the winter months in the town before the travelling summer season. The hotel was demolished in the early 1960’s to be replaced by a Tesco supermarket.